The challenges we face can be difficult even to think about. Climate change, the depletion of oil, and a politically divided nation create what can feel like an emergency of overwhelming proportions. 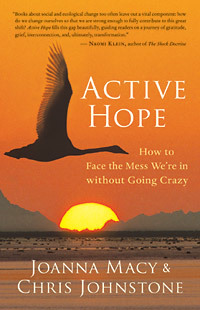 In their book, Active Hope: How to Face the Mess We’re in without Going Crazy, authors Joanna Macy and Chris Johnstone show us how to strengthen our capacity to face this crisis so that we can respond with unexpected resilience and creative power. Drawing on decades of teaching an empowerment approach known as the Work That Reconnects, the authors guide us through a transformational process informed by mythic journeys, modern psychology, spirituality, and holistic science. This process equips us with tools to face the mess we’re in and play our role in the collective transition, or Great Turning, to a life-sustaining society. We hope you’ll enjoy this excerpt from the book. “Dangerous,” “frightening,” “out of control” — as we go around the room, people are calling out the word or phrase that comes to mind as they complete this sentence: “When I consider the condition of our world, I think things are getting...” Over the last few decades, we’ve done this process with tens of thousands of people in a wide range of settings. The responses we hear echo survey findings that show high levels of alarm about the future we’re heading into. Such widespread anxiety is well-founded. As our world heats up, deserts expand and extreme weather events become more common. Human population and consumption are increasing at the same time as essential resources, such as freshwater, fish stocks, topsoil, and oil reserves, are in decline. While reversals in the economy have left many feeling desperate about how they’re going to manage, trillions of dollars are spent on the making of war. Given these adversities, it is no surprise if we experience a profound loss of confidence in the future. We can no longer take it for granted that the resources we’re dependent on — food, fuel, and drinkable water — will be available. We can no longer take it for granted even that our civilization will survive or that conditions on our planet will remain hospitable for complex forms of life. We are starting out by naming this uncertainty as a pivotal psychological reality of our time. Yet because it is usually considered too depressing to talk about, it tends to remain an unspoken presence at the backs of our minds. Sometimes we’re aware of it. We just don’t mention it. This blocked communication generates a peril even more deadly, for the greatest danger of our times is the deadening of our response. Yet when we do face the mess, when we do let in the dreadful news of multiple tragedies unfolding in our world, it can feel overwhelming. We may wonder whether we can do anything about it anyway. Jane cared deeply about the world and was horrified by what she saw happening. She regarded human beings as a lost cause, as so stuck in our destructive ways that she saw the complete wrecking of our world as inevitable. “What’s the point of doing anything if it won’t change what we’re heading for?” she asked. The second meaning is about desire. When Jane was asked what she’d like to have happen in our world, without hesitation she described the future she hoped for, the kind of world she longed for so much it hurt. It is this kind of hope that starts our journey — knowing what we hope for and what we’d like, or love, to take place. It is what we do with this hope that really makes the difference. Passive hope is about waiting for external agencies to bring about what we desire. Active Hope is about becoming active participants in bringing about what we hope for. Most books addressing global issues focus on describing either the problems we face or the solutions needed. While we touch on both of these, our focus is on how we strengthen and support our intention to act, so that we can best play our part, whatever that may be, in the healing of our world. Since we each look out onto a different corner of the planet and bring with us our own particular portfolio of interests, skills, and experience, we are touched by different concerns and called to respond in different ways. The contribution each of us makes to the healing of our world is our gift of Active Hope. The purpose of this book is to strengthen our ability to give the best gift we can: our finest response to the multifaceted crisis of sustainability. When we become aware of an emergency and rise to the occasion, something powerful gets switched on inside us. We activate our sense of purpose and discover strengths we didn’t even know we had. Being able to make a difference is powerfully enlivening; it makes our lives feel more worthwhile. So when we practice Active Hope, we not only give but we receive in so many ways as well. Physician, coach and coauthor of Active Hope, Dr. Chris Johnstone is a specialist in the psychology of resilience, happiness, and positive change. Ecophilosopher and coauthor of Active Hope, Joanna Macy, PhD, is a scholar of Buddhism, general systems theory, and deep ecology. A respected voice in movements for peace, justice, and the environment, she interweaves her scholarship with five decades of activism. Excerpted from the book Active Hope. Copyright © 2012 by Joanna Macy and Chris Johnstone.